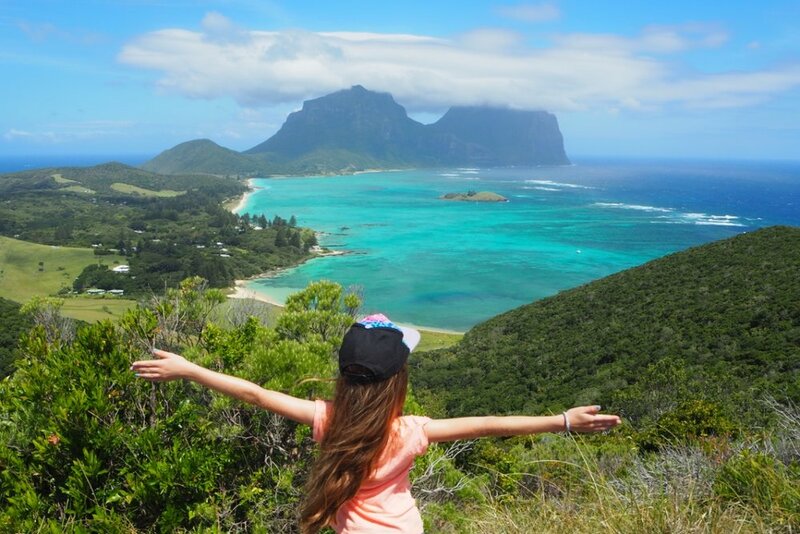 Lord Howe Island is truly extraordinary, and should be high on every Australian traveller's list. Yes it's expensive - both to stay and to get there - but for my money, I'd choose to holiday on this pristine island over an overseas holiday any day. And with the opening of several luxe, new beach holiday houses, there's even more reason to go. Lord Howe Island. Seriously, just take my money! Taking in the spectacular vistas from the top of Kim's Lookout. It's one of those perfect blue-sky days when we fly into Lord Howe Island. I'd made the spectacular arrival into the island a few times now on Qantas Link's trusty Dash 8s, so averted my eyes from the dreamy vistas outside and turned instead to watch my mum seated in a window seat. It's Mum's first time visiting the island that National Geographic proclaimed as "the most beautiful in the Pacific". As we descend, the majestic peaks of Mount Gower and Mount Lidgbird soar out of the sparkling lagoon. Shaking her head in utter disbelief, mum's face says it all. Within moments of leaving the quaint white-picket-fence airport, we've checked into Arajilla Retreat's brand new beach house, Blue Peter; the closest accommodation to the beach and a Lord Howe Island landmark. A hop, skip and jump across from Lagoon Beach, the building was in turn a haberdashery, an airline office, a general store, then home to the island's first espresso machine. It operated as Blue Peter Cafe for almost a decade and whenever we mention where we're staying, locals sigh and say they still miss it. After lying dormant for years, Arajilla owners Bill and Janne Shead were given approval to turn the building into accommodation – on the proviso two licensed "bed" numbers were shifted from Arajilla. 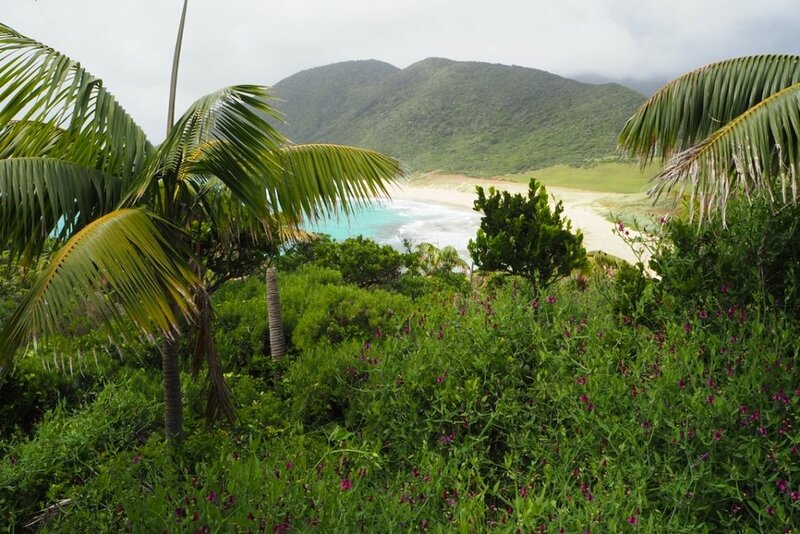 Only 400 visitor beds are allowed on Lord Howe at any one time. The entrance way to Blue Peter's Beach House; a quintessential Lord Howe Island building now with a new lease of life as a luxe private beach house. They set to work transforming the property into a luxury fully self-contained two-bedroom beach house, just for two. The spacious interiors were painted white, louvre windows and plantation shutters installed, along with two bathrooms and a fully equipped kitchen. 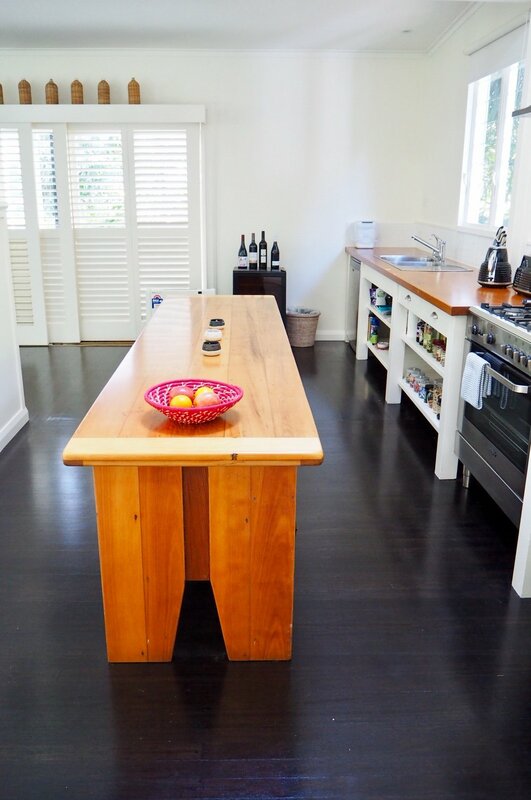 The enormous kitchen comes with a Nespresso machine and is generously stocked with Arajilla muesli, milk, bread, butter, jams and honey, homemade biscuits, fruit and more. 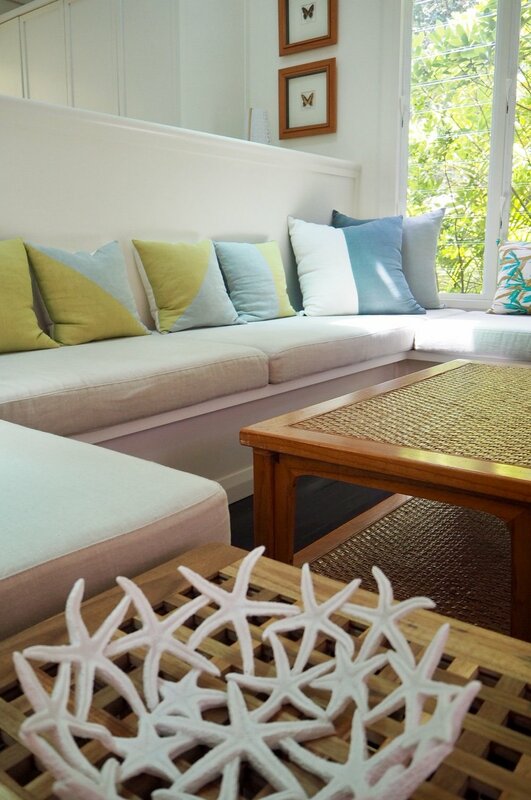 Blue Peter's beachy interiors are offset by dark wood floors, pure linen bedding and fabrics and rugs by Sydney artist Julie Paterson of Cloth Fabric. Best of all is the enormous timber deck under an equally generous pergola bordered by lush foliage. This is where we head each morning, taking our pot of tea with us and settling in for a morning of reading, interspersed by swims, strolls to the shops (which the locals refer to jokingly as the CBD), and regrouping in the late afternoon for G&Ts. While the house is self-contained, it is serviced daily and Arajilla staff are on standby to help. When I mention I need a lemon for said G&Ts, one is rustled up. When Mum asks for skim milk, a carton appears in the fridge. They drive us to dinner each night, transport bikes from Arajilla for us to use, all with a breezy "no problem" attitude. One memorable moment, among many, is sitting outside on the deck, which is framed by an enormous Asian-style wooden entrance, and watching an emerald dove in her nest with two baby chicks. The mother bird had made a large palm at Blue Peter her home, and it was fascinating being able to watch the little feathered family up close. Blue Peter is not the only new beach house to open on the island, where development of any sort happens at a snail's pace. A short distance away is the contemporary purpose-built Bowker Beach House, opened in 2015 by Lisa Makiiti and Rod Oxley, which sits in native forest opposite the beach and was designed by architect Craig Pattinson. Recently the couple have opened the brand new Lagoon Landing next door. The two stand-alone beach houses are traditional island style, and sit in an almost rural setting surrounded by kentia palms, frangipani and bananas with a wonderful vegie garden and huge frangipani tree. Chooks, along with a horse and cow that are lifelong friends, live on the property. Over at Ned's Beach meanwhile, the island's newest luxury accommodation Admiralty Apartments, are set to open this month (January). The two self-contained beach houses offer filtered sea views through palm trees, and a private track leading directly to the beach. Pandanus Lodge is also set to unveil its luxury new accommodation, designed by Derive Architecture. Unfortunately, because of Lord Howe Island's tight restriction on visitor numbers, none of these beach houses can take children, even though they'd easily accommodate them. For those with kids in tow, look instead at Arajilla, or Pinetrees (both are which are fantastic for families. 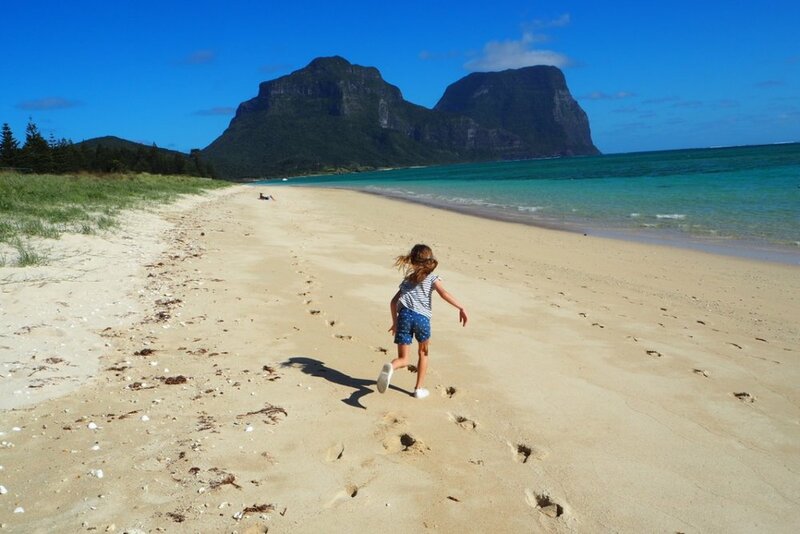 I'll do a seperate blog on Lord Howe Island for families later). Operators say the new beach houses reflect a growing demand for stylish, private and luxurious accommodation on one of the world's last unspoilt island paradises. Demand is certainly there with a flood of bookings from day one. They certainly make it just that little bit harder to leave one of my favourite corners of the world. Sheriden Rhodes travelled courtesy of Lord Howe Island Tourism Board and Blue Peter.